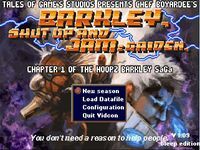 "Tales of Game's Presents Barkley, Shut Up and Jam: Gaiden, Chapter 1 of the Hoopz Barkley SaGa is a freeware RPG developed by Tales of Game's Studios, presented as an unofficial sequel to Barkley Shut Up and Jam!. It features traditional JRPG-styled battles and dungeons. The game takes place in a post-cyberpocalyptic New York called "Neo New York", after a "chaos dunk" causes the death of millions." Source: Wikipedia, "Barkley,_shut_up_and_jam_gaiden," available under the CC-BY-SA License.